SHOWTIME will be available in over 80 million households for a Free Preview Weekend from Friday, January 11 through Sunday, January 13, the network’s biggest free preview audience ever. The network currently attracts 22 million subscribers and will be available to 58 million more, for one weekend only. Viewers across the country will have the opportunity to sample the premium network’s award-winning programming on SHOWTIME, SHOWTIME HD™, SHOWTIME On Demand® and SHOWTIME ANYTIME®. The Free Preview weekend will include the series premieres of the critically-acclaimed hit series SHAMELESS, HOUSE OF LIES and CALIFORNICATION, live offerings from SHOWTIME Sports® including ShoBox: The New Generation and STRIKEFORCE, and the television premieres of the blockbuster hit The Twilight Saga: Breaking Dawn – Part I and The Iron Lady, starring Meryl Streep in her Oscar® winning role. Free Preview Weekend viewers will also have access to every season of the critically-acclaimed SHOWTIME original series DEXTER, HOMELAND, SHAMELESS, CALIFORNICATION, NURSE JACKIE, THE BORGIAS, EPISODES, WEEDS, THE BIG C, and the freshman seasons of INSIDE COMEDY, Oliver Stone’s UNTOLD HISTORY OF THE UNITED STATES and HOUSE OF LIES, all available on SHOWTIME On Demand and SHOWTIME ANYTIME. Read more after the jump. SHOWTIME will also air a variety of feature films and documentaries throughout the weekend, including My Week with Marilyn, The Help, War Horse, Source Code, A Better Life, Our Idiot Brother, Real Steel, Scream 4, Fright Night, The Twilight Saga: Eclipse and 50/50. The Free Preview Weekend will be offered by nearly 50 distributors nationwide including AT&T U-verse, Cable One, Comcast, Cox, DIRECTV, DISH, Mediacom, Suddenlink, Time Warner Cable and Verizon FiOS. Live on Friday, January 11 at 11:15 p.m. ET/PT (delayed on the West Coast), SHOWTIME will air its celebrated, prospect-oriented boxing series ShoBox: The New Generation, featuring undefeated 22-year-old Ronny Rios facing his toughest fight to date, when he takes on former world champion Rico Ramos in a 10-round featherweight bout in the ShoBox main event. Then, on Saturday, January 12 at 10 p.m. ET/PT (delayed on the West Coast), STRIKEFORCE Welterweight Champion Nate Marquardt will defend his title against top contender Tarec Saffiedine in the main event on SHOWTIME. Four additional bouts will air on the telecast leading up to the main event and four preliminary fights will air on SHOWTIME EXTREME beginning at 8 p.m. ET/PT. Saturday’s main event will be followed by an encore presentation of the series premiere of the network’s new magazine show, 60 MINUTES SPORTS, featuring a rare interview with record-breaking soccer player Lionel Messi. On Friday, January 11 at 8 p.m. ET/PT, SHOWTIME will premiere The Iron Lady, starring Meryl Streep in her Academy Award® and Golden Globe®-winning role. The film offers a look at the rise and fall of trailblazing politician Margaret Thatcher, as Streep brings Thatcher to vivid life over a 40-year span. The Iron Lady imagines how the longest-serving Prime Minister of the UK, and the first woman ever to be elected as head of government in the West, reconciles her groundbreaking history with the costs of power. On Saturday, January 12 at 8 p.m. ET/PT, the blockbuster hit The Twilight Saga: Breaking Dawn – Part I, will make its television debut. Bella (Kristen Stewart) and Edward (Robert Pattinson), plus those they love, must deal with the chain of consequences brought on by their ornate nuptials, a romantic honeymoon, and the tumultuous birth of their child – which brings an unforeseen and shocking development for Jacob Black (Taylor Lautner). Academy Award winner Bill Condon directs this first installment of The Twilight Saga’s final chapter. Then, on Sunday, January 13 from 9 to 11 p.m. ET/PT, viewers nationwide will get a taste of three critically-acclaimed SHOWTIME series, with the third season premiere of SHAMELESS (9 p.m. ET/PT), the second season premiere of the comedy series HOUSE OF LIES (10 p.m. ET/PT) and the sixth season premiere of CALIFORNICATION (10:30 p.m. ET/PT). 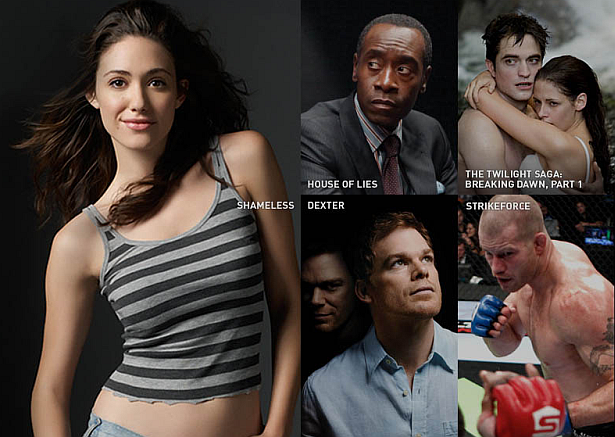 The third season of SHAMELESS premieres on Sunday, January 13 at 9 p.m. ET/PT. It’s several months after the last season ended and the Gallaghers are each seeking their own unique version of the “American Dream.” Jimmy (Justin Chatwin) has moved into the Gallagher home, and Fiona (Emmy Rossum) soon realizes that a GED will only get her so far and that a long-term relationship with Jimmy isn’t as fulfilling as she expected. Meanwhile, Frank (William H. Macy) reappears south of the border with no idea as to how he got there. Emmy® winner and Golden Globe nominee Bradley Whitford (The West Wing) will guest star. Based on the long-running hit UK series, SHAMELESS is executive produced by Emmy Award-winning television and film producer John Wells, as well as Paul Abbott and Andrew Stearn. Wells developed the series for American television. The second season premiere of HOUSE OF LIES follows at 10 p.m. ET/PT. Starring Oscar-nominated actor Don Cheadle in his Emmy-nominated role as Marty Kaan alongside co-star Kristen Bell, this series is a timely comedy that dives head-first into the shark tank known as corporate America. Marty is the big-money earner at Galweather Stearn, who commands a hot, young team known as The Pod: Jeannie (Bell), Clyde (Ben Schwartz) and Doug (Josh Lawson). This season, The Pod – especially Marty and Jeannie – must deal with the fall-out from the big merger showdown. Meanwhile, Marty is thrown by the arrival of a new ‘frenemy’ at work and by Roscoe (Donis Leonard Jr.), who decides to move in with his lunatic mother, Monica (Dawn Olivieri). Larenz Tate (Rescue Me), Nia Long (Third Watch) and Lisa Edelstein (House) have signed on as recurring season two guest stars. The series is based on the hit tell-all book from best-selling author Martin Kihn (House of Lies: How Management Consultants Steal Your Watch and Then Tell You the Time). Produced by SHOWTIME, HOUSE OF LIES is created and executive produced by Matthew Carnahan. Jessika Borsiczky, Stephen Hopkins and Don Cheadle also serve as executive producers. At 10:30 p.m. ET/PT, the sixth season of CALIFORNICATION returns with David Duchovny in his Golden Globe-winning role as hedonistic novelist Hank Moody. Moody continually struggles to be a good father to his college-aged daughter Becca (Madeleine Martin), while still carrying a torch for her mother, and his ex-girlfriend, Karen (Natascha McElhone). This season, noted actress Maggie Grace (Lost) has signed on for nine episodes as the infamous rock groupie Faith, who develops an unconventional relationship with Hank. She is joined in two episodes by her former Lost co-star Jorge Garcia as an old contact from Faith’s past. International comedy star Tim Minchin takes on the role of Atticus Fetch, a mad-as-a-hatter rock star who will write the music for the Broadway production of Hank’s hit novel. Fetch enlists the ever-cynical Hank to collaborate on the project, which he calls “…a rock opera about love conquering all.” Notorious rocker Marilyn Manson will also make a guest appearance. CALIFORNICATION is created and executive produced by Tom Kapinos and executive produced by Duchovny.